We are honored and privileged to bring you an interview with Jody Bottone. In case you don't know who Jody is you might know her on Twitter as MuayThaiJody. She is also the awesome Graphic Designer who helped us take our new logo from a concept on a piece of paper to the finished product which we just unveiled last week. We are grateful to Jody for her willingness to work many hours with our team to make our logo what it is today. We would highly recommend Jody to anyone who is looking for a logo redesign or an initial logo build, she has great customer service and as you can see by our new logo she is a great Graphic Designer. Without giving away all of her secrets here is our interview with Jody. SchenkMMA: Tell us a little bit about yourself. Jody: My name is Jody and I live in NJ, the Jersey shore area (not to be confused with that TV show), I have a wonderful husband and two awesome dogs, a bulldog mix and a greyhound. I am a graphic artist by day and at night I'm either hanging at home or at the gym doing Muay Thai. SchenkMMA: How did you get interested in Martial Arts? Jody: I enjoy working out and wanted to do something outside of a home workout without joining a typical gym. I was always a big fan of kickboxing videos so I thought I'd look for some real form of kickboxing to learn, might as well earn a belt & learn some self defense while working out. I didn't realize that I'd become hooked so fast. 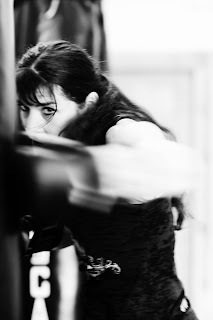 It quickly became more than a workout, I really wanted to learn the proper form and technique then not too long after I started to spar (which I never thought I'd do). Martial arts is great, you're constantly pushing yourself, pushing your own boundaries. SchenkMMA: Do you currently practice any Martial Arts? If you do what belts do you hold in what Martial Arts? Jody: I currently practice Muay Thai. I began training in April 08. I'm at my third gym now so my belts aren't consistent. The first gym I trained at for almost 2 years where I received a purple belt. I was spending just as much money traveling to the gym as my monthly membership and couldn't afford it anymore so I switched gyms, stayed with the 2nd gym for 1-1/2 years where I went from white to purple again. Then just this past June I switched gyms again and now I currently train at Girl Fight MMA where I have a white belt. SchenkMMA: What got you interested in MMA? Jody: My first interest was Muay Thai but everybody at the gym talked about UFC / WEC, and even though I didn't have much interest in the ground part I started watching so I could see the stand up part. I quickly became hooked and would watch all the free fights on TV. I then started to follow WMMA as well. There's been some big changes in the sport for women just in the last few years. It was so awesome seeing Cyborg v Carano for the first Strikeforce 145 belt then seeing them add the 135 belt. Hopefully more changes to come soon. SchenkMMA: What do you do for work? Jody: I'm a graphic artist. I work for a transportation company full time We have our own print shop with printing presses so we do everything in house; business cards, forms, annual reports, signs, brochures, postcards, posters, banners, etc. I've also worked on instruction manuals and packaging for some playstation and Wii games; I've done CD inserts, photo retouches, logos, book covers, etc. I have a portfolio online at http://www.jodybottone.com/portfolio.html with some of my work. SchenkMMA: Tell us about your hobbies? Jody: Muay Thai of course, other than that I like to hang out with my husband and my dogs. SchenkMMA: What is the last book you read? Jody: I'm reading a series of books called the Spook's Stories by Joseph Delaney, so the Spook's Nightmare, book 7 was the last book I read. Starting book 8 this week! SchenkMMA: What is a normal day in your life like? Jody: Get up at 5:15, get to work at 7am, at lunch I do a run/walk during the week weather permitting. At home, I lift weights 3x a week and do bag work or some form of cardio, I also go the gym for Muay Thai about 3x a week. Then, its cook, eat, clean, sleep, repeat! SchenkMMA: What is one of your life motto’s you try to live by? SchenkMMA: What is your dream job to one day be doing? Jody: Well of course I love my full time job but since I like graphic arts and I love MMA it would be awesome to be able to do any type of graphic arts in the MMA industry, that would be ideal! Fight posters, program books, ads, clothes, anything would be awesome and it would be fun! SchenkMMA: Which is your favorite MMA promotion currently and why? Jody: UFC. My husband & I love to go to UFC fights, we go to the weigh ins and Q&A the day before, we make a whole trip out of it. I'm so lucky my husband likes watching the fights too! We've been to a lot of great places and met lots of cool people. Can't wait to see where UFC takes us in 2012!! SchenkMMA: What drives your passion for MMA? And WMMA? Jody: The challenge, the focus, and how I'm constantly able to push myself. The longest minutes (seconds) of my life are in the gym but the rewards are well worth it! These are tough workouts, you need to be focused, learn to trust your body and not let your mind stop you. When you think you can't do something, you just do it, you don't stop, you don't quit, you just do it....and that's what I love! After all this time I am still amazed at what my body can do. I feel I can always challenge myself and grow in this sport as there will always be room for improvement. Martial arts has made a big difference in my life, I've learned respect, humility and I feel more confident and balanced too. SchenkMMA: What is your favorite kind of music to listen to? Jody: I like rock, heavy metal. SchenkMMA: What is your favorite blog that you read at least a couple of times a week? Jody: I probably check out cagepotato.com the most. 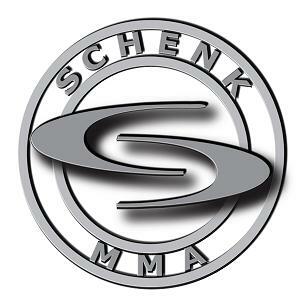 SchenkMMA: Is there anyone you would like to thank or send a shout out to? Jody: You of course! I'd like to thank you for this interview! I'd also like to thank Prairie Rugilo from Girl Fight MMA for the use of the gym and Karen O'Brien for the awesome picture! * Last but not least Jody from all of us here at SchenkMMA we are very thankful for all you have done for us and we look forward to working more with you in the future. That's my daughter. I am so proud of her. Bob she does great work you should be very proud of her she has a true gift. We would like to Thank you Jody for being such a great role model for other women in the industry!! Thanks for the comment GirlFightMMA we agree with you. She is a great person and a great role model for women world wide.